Lobsters are not a take it or leave it seafood. It’s plain and simple. Either you love lobster or you don’t. Our family falls into the first category. We savor these sweet juicy crustaceans on any chance that comes our way as a dinner or on a roll. Our family lived in New York much of our lives and we vacationed where lobster reigned supreme from Montauk and the Hamptons in Long Island to the New England seaside areas of Rhode Island, Massachusetts and Maine. We recently returned from a trip to the Maine coast expecting to see some vibrant fall foliage and of course taste delicious lobster. It was not a great year for fall foliage due to extremely warm weather conditions but I am happy to report that we can put our crustacean obsession to rest because we found the BEST, yes! The BEST lobster roll you will ever taste at Red’s Eats in Wiscasset, Maine outside of Boothbay Harbor. We drove on US 1 past this cute quirky little red and white seafood place on our way to our resort in the Rockport area. The little seafood shack was lined with patient smiling Customers wrapped around the small building so we knew it was a priority on our GO TO bucket list. Our casual lobster roll curiosity was now a full blown quest for the best lobster roll in coastal Maine. Of course, I began to Google them on the internet along with nationally recognized travel sites and there they were along with beautiful pics of lobster rolls. The meat was piled so high that you could barely see the bread, accompanied by a side cup of local hot butter. No lettuce. No Mayo. No fillers. And that my friend is what separates a lobster dabbler from serious lobster roll aficionado. It was a brisk day but no one cared. Everyone had lobster rolls on our mind. The lobsters are steamed and yes a little cold when you get it but this is not a bad thing. It’s October and the weather is windy but the side cup of sweet locally crafted butter takes care of the chill. The roll is buttery and slightly grilled to support the volume of meat. You want fries or onion rings or anything else? Sure. It is all reasonably a la carte and one portion of fries was more than enough for 2 adults. We first visited Red’s Eats on Monday and from that moment on, we were hooked. The owner and staff were so friendly. Amidst the hungry crowd, they found the time to smile, make quick small talk and win our loyalty. Why go anywhere else? We opted to abandon the typical lobster dinner at a well known restaurant in a neighboring town on Wednesday and visit Red’s Eats a second time. She remembered us when we reached the ordering counter and rang the bell, announcing over her PA system that we were 2nd time visitors this week as everyone clapped and cheered. I realize this is starting to sound like a restaurant review but after serving loyal Pinocchio’s Ice Cream Customers these past 12 years at our Sanibel store, I realized why Tom and I were so enamored with this establishment. Red’s Eats is a family run business that offers the best quality lobster in huge portions with a smile and a reason to return again. These are the simple principles that we used to grow our own business into the destination landmark it is today for handcrafted frozen confections. What can I do now that we are back home in SW Florida? 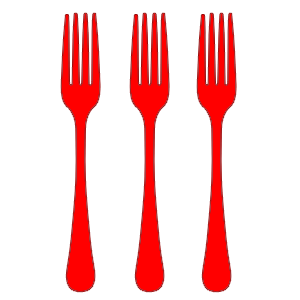 Ship some Maine Lobster meat TKC (tails – knuckles – claws) along with decent bread to grill and locally crafted butter. Then I can hope it will taste as good as it did at Red’s Eats. If not, we need to plan our next trip to Wiscasset. Cash Only. No Credit Cards. No worries. They have an ATM right next to the ordering counter. This is a small establishment with outdoor patio seating on upper level and outdoor seating by the water on the lower level. Their accolades are endless. Don’t be surprised to see a TV food chef or celebrity waiting on line with you. Go online and order a pound or two (or five?) of fully cooked TKC lobster meat. There are plenty out there to choose from. Red’s Eats website even lists some that will ship right to your door. Buy some top sliced buns. Slowly melt sweet salted butter. I cut my own fresh herbs and add them to the butter for extra flavor and I remove them just before serving. Pile it high on the lightly grilled bun, dip into the butter and Enjoy! Serve with shoestring potato fries, sweet potato fries, onion rings or a bag of your favorite flavored kettle cooked potato chips. Enjoy! Trip #2. Look at those tails, knuckles and claws! I write this from miles away hoping to have a Red’s Eats Lobster Roll for lunch. A girl’s gotta dream. Tomato and Cheese pies have been something on my bucket list to prepare for quite some time. 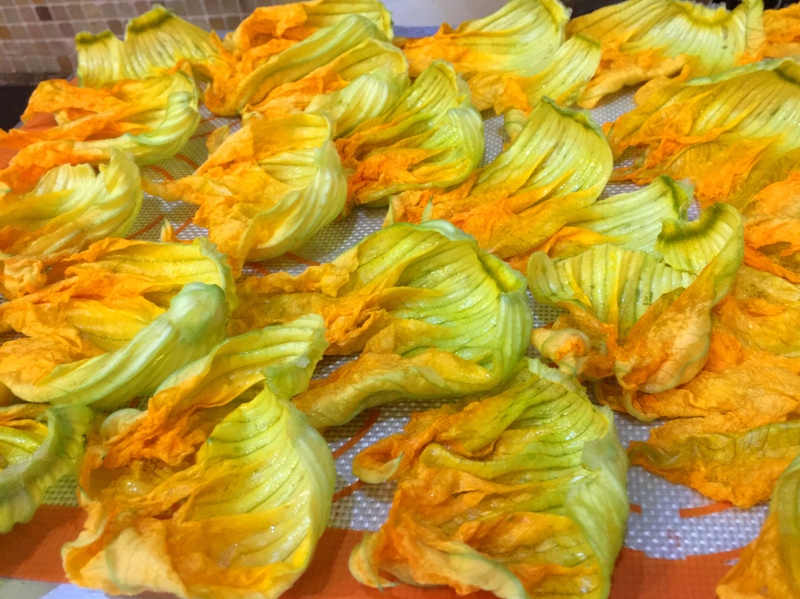 I had the pleasure of making this vegetarian delight for good friends and fellow fooderati at the Sanibel Community House when I was asked to speak about tomatoes at our monthly potluck dinner lecture series a few months ago. The Sanibel Community House is in the process of raising funds for a major renovation which will include a large professional kitchen to accommodate food crafting and cooking classes for islanders, vacationers and everyone interested in the Sanibel and Captiva Island community. For more information, check out their efforts on www.sanibelcommunityhouse.net. This pie is so simple to prepare that I tried making several versions the next day for my bakery on Sanibel Island, Geppetto’s Beach Foodies. It is a vegetarian favorite and a new staple on our menu. Even more exciting is that I shared the recipe with a close friend from New York. Fedela Kessler tried the recipe and sent me a pic of her craft (see below). Thanks Fedela for trying it out and sending your feedback. I miss our diner chats. In a hurry and you have no time to make your own pie crust? Try Pillsbury Pet Ritz brand frozen pie crust shells. The Pet Ritz crust is flaky, buttery and withstands sweet fruit or savory tomato liquids when the pie is cut. 6 medium beefsteak tomatoes. Note: I mixed in colorful heirloom tomatoes for interest. 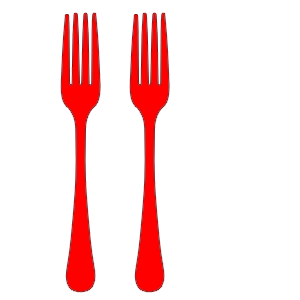 Poke holes with fork tines – 10 to 12 times. Bake frozen pie crust shells for 8 minutes. Remove and Cool. In a bowl, combine 1 ½ cups shredded mozzarella with 1 cup mayonnaise. Layer the tomatoes in the pie shell. Layer the ½ cup scallions. Spread the cheese/mayo mixture on top. Garnish with grape tomatoes, remaining chopped basil, salt , pepper, Italian seasonings. BAKE the pie for 30 minutes in a 350 degree oven or until the cheese is melted and lightly browned. Substitute Cheddar or Monterey Jack shredded cheese or make a pie with a combination of cheeses. Substitute ½ of the amount of mayo with plain yogurt. Turn this into a one meal pie. Add a layer of cooked and sliced sausage or a healthier alternative of cooked ground turkey meat or fish. For a firmer bottom crust, layer some cheese slices on the bottom of the pie. Then add the tomato, onions, meat if desired. My husband, daughter Stephanie and I could not wait to begin a new chapter in our life by moving to Southwest Florida after vacationing on Sanibel and North Captiva Islands for over 20 years. Although there are no regrets while enjoying beautiful sunsets, shelling and never having to shovel snow from our walkways, we unanimously agree that the smell and feel of autumn is sorely missed. Yes, raking all those leaves is not something we pine for but the weekend visits to our favorite local farms, the taste of apple cider, determining who will make it through the corn maze first this year and of course, finding the perfect pumpkin. While my family searched high and low for the classic shape color and size worthy of our carving skills, I searched for beautiful bright yellow flowers attached to the pumpkin and squash vines. Mr. Henry Dykeman of Dykeman Farms in Pawling, NY would hand me a brown paper bag and watch as I surveyed his beautiful farm for these golden beauties. He would ask how I planned to prepare them for my family and nod in approval. Ahhhh. The memories of returning home with all of our farm treasures and knowing the next few hours would be spent cleaning and cooking these delicacies which became a family tradition. Moving this story fast forward to Florida, I would venture to farm stands and ask if they could order pumpkin or squash flowers for me. They would politely look at me as if to say “What are they and why do you want them?” I am eternally greatful to John, the owner of Pair-A-Dice, my local produce store around the corner from my home for knowing what pumpkin and squash flowers were used for in cooking and for always going the extra mile whenever I ask him for something out of the ordinary. My advice is to find a caring produce provider like John and give these a try. You may find yourself creating a new tradition to welcome fall. 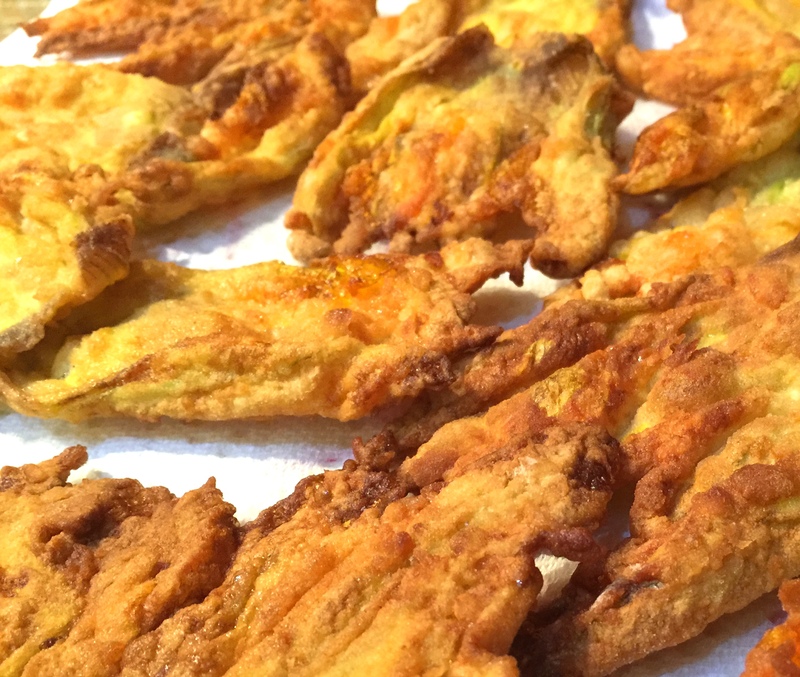 Note: I reference Pumpkin flowers but squash/zucchini flowers will work as well. 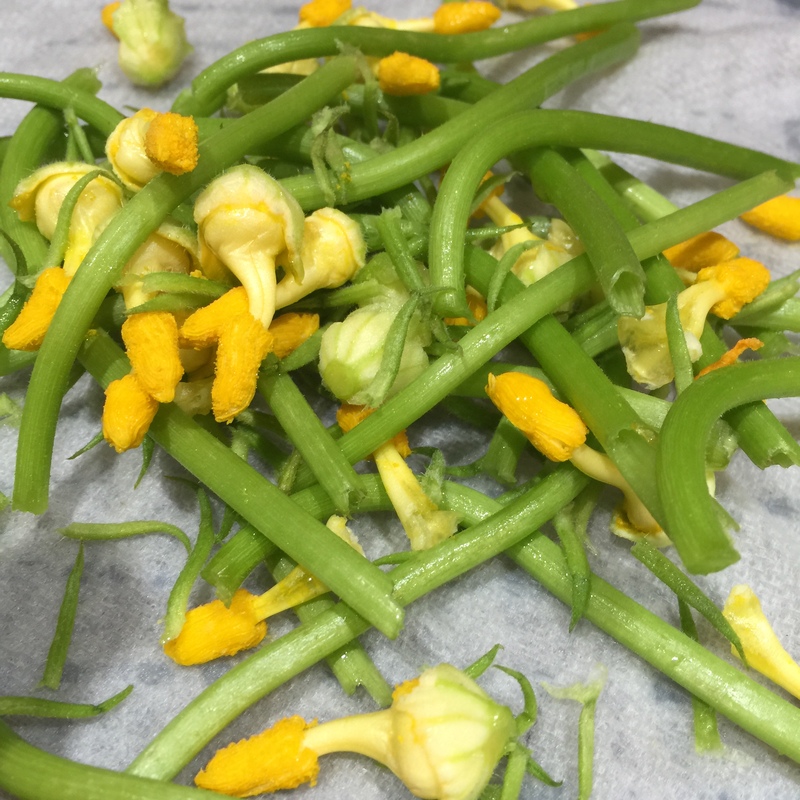 Squash flowers are smaller in size but offer a similar delicious seasonal taste. Enjoy! Rinse each flower individually under cold water. Remove the stem. Gently, open the flower and pull out the stamen. Rinse the inside of the flower with cold water. 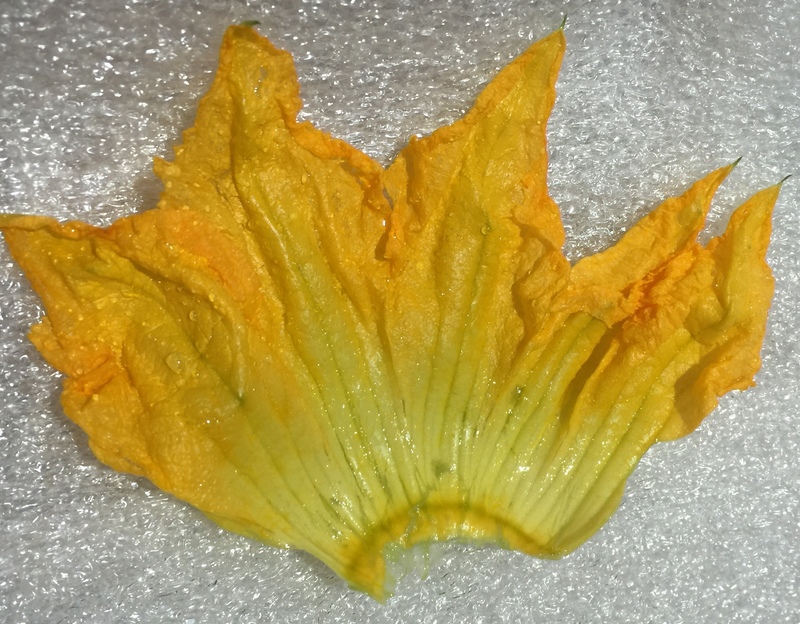 I prefer to break one side of the flower and lie them flat on a paper towel for drying but some prefer to keep the flower intact which is important if you planned to stuff the flowers but not for this recipe. Pat the flowers dry with a paper towel. Whisk the eggs, milk and dash of cinnamon, salt and pepper to taste for the egg bath in a shallow 9 inch pan or baking dish. Have your flour ready in a similar 9 inch pan or baking dish. Dredge the clean dry flowers, one at a time through the egg mixture and then dredge them through the flour. Place on a cookie sheet. *Note: I use a Silpat on my cookie sheet. If not, Parchment paper works well. Heat the oil in the skillet on Medium to High Heat #5 – #6. 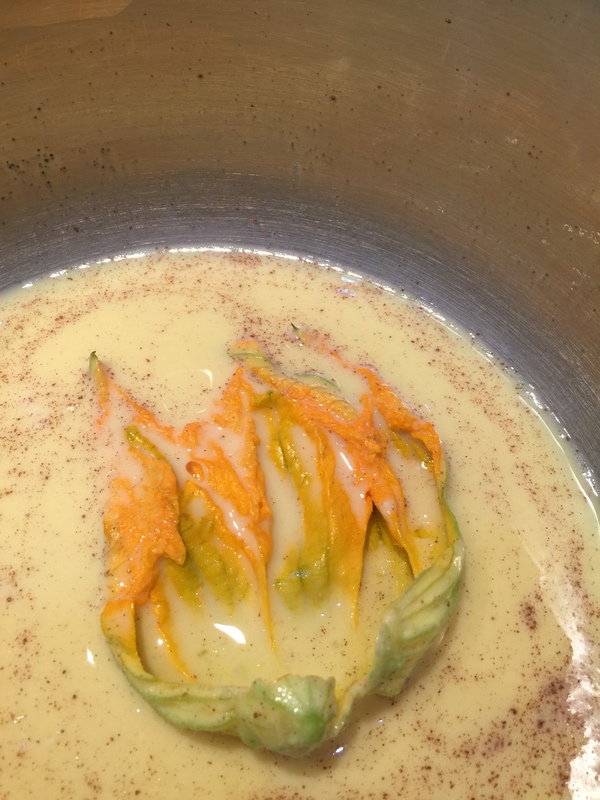 Drop the pumpkin flowers one at a time in the oil and lower the heat to #4 for a golden coat. 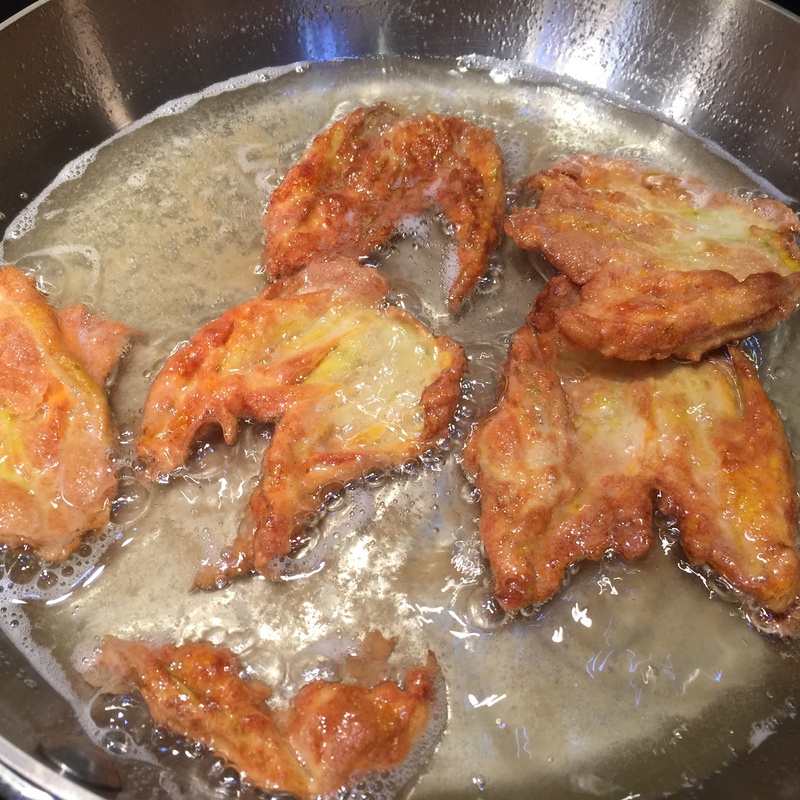 You do not want them to cook on high heat continuously which will result in an over-fried brown coating. Watch them carefully and turn them over once the ends of the flowers begin to cook/sizzle. Remove them with a slotted spatula and place them on a clean Silpat cookie sheet. Note: I typically use paper towels to absorb the oil but in using less oil in a smaller frying pan/skillet at a reduced temp, I eliminated the need to absorb excess oil. While warm, grind some fresh sea salt and even a very small dash of cinnamon for taste. 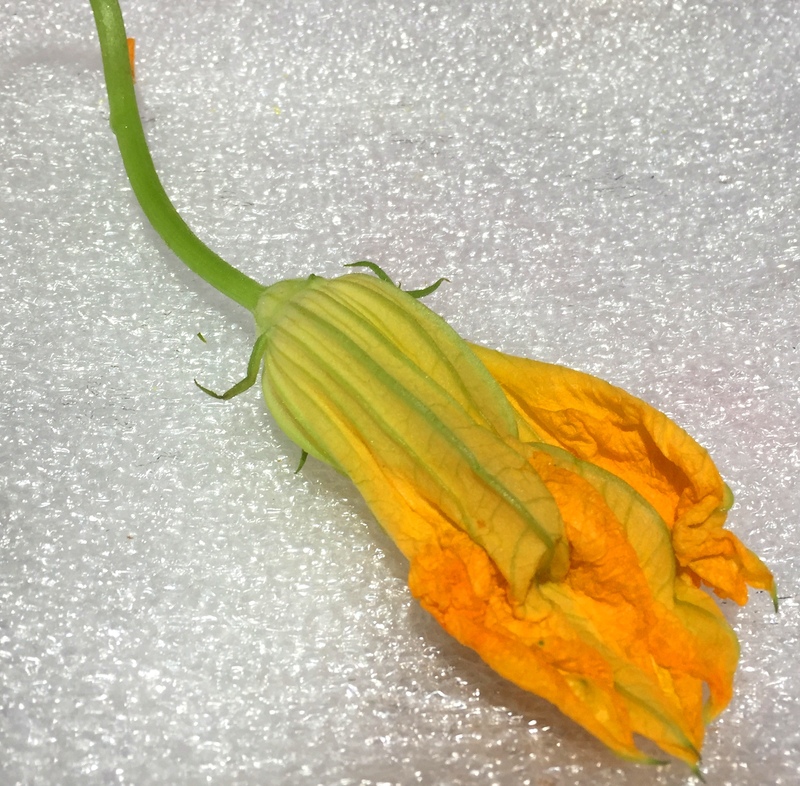 Store the pumpkin flowers in an airtight container in the refrigerator for 3 – 4 days or in freeze them in an airtight container among layers of wax paper up to 3 – 4 weeks. 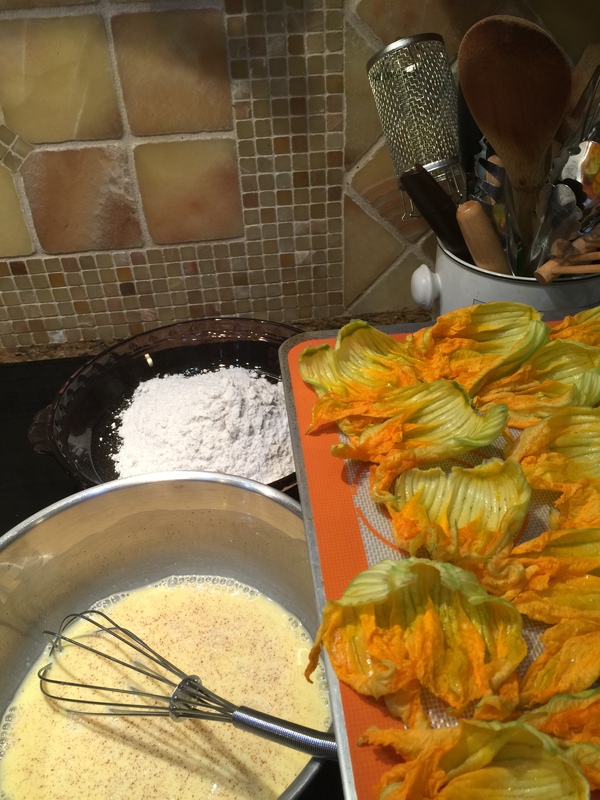 I have made pumpkin flowers in mid to late October and managed to preserve them as an accompaniment to our Thanksgiving meal. Simply defrost the flowers for 10 minutes. 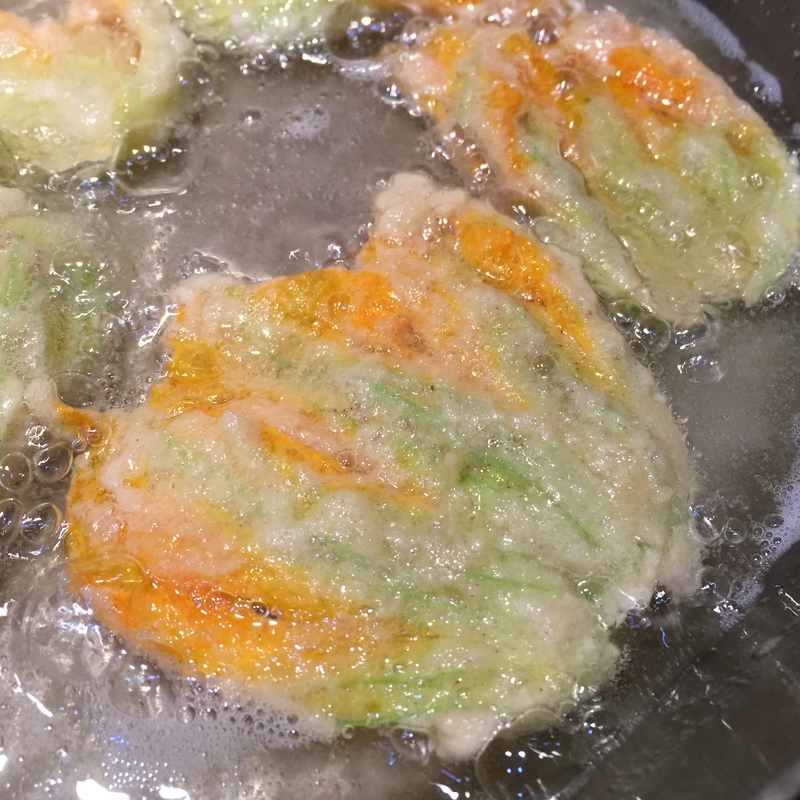 Spread them on a Silpat cookie sheet and warm them in a 325 degree oven for 7 – 10 minutes. Regardless of the cities we visit during our stay in Italy, Tom and I are always inspired to try their local gelato. We have had some really creamy delicious gelato during our holiday this year but I have to say that each annual trip to Tuscany and Umbria warrants a return visit to the city of Orvieto where gelato is one culinary staple that is taken seriously and revered by Italians at their International Gelato Festival which we attended in 2013. It may sound odd, but buffalo mozzarella gelato anyone? The historic city of Orvieto is a must stop for Tuscan travelers driving north from the eternal city of Rome and heading toward the Tuscan sun. 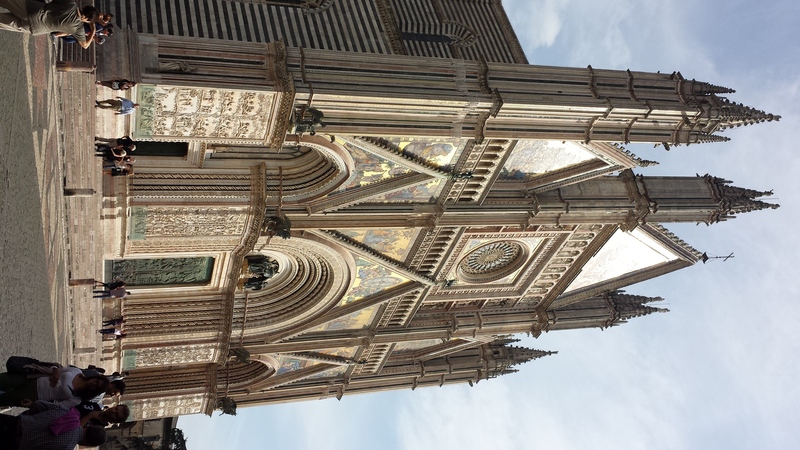 We love Orvieto for the handmade pottery, the warm friendly shopkeepers who remember us from the year before, the magnificent Duomo and yes, for a taste of our favorite artiginale gelato at the caffe del corso. I recently posted a picture on Instagram of my Orvieto gelato cornet with Miritello (Blueberry), Chocolate and my new favorite, Cassata gelato which is so creamy and rich that I could not differentiate if I was eating a cannoli, the filling of a rich cassata cake or my delicious gelato. 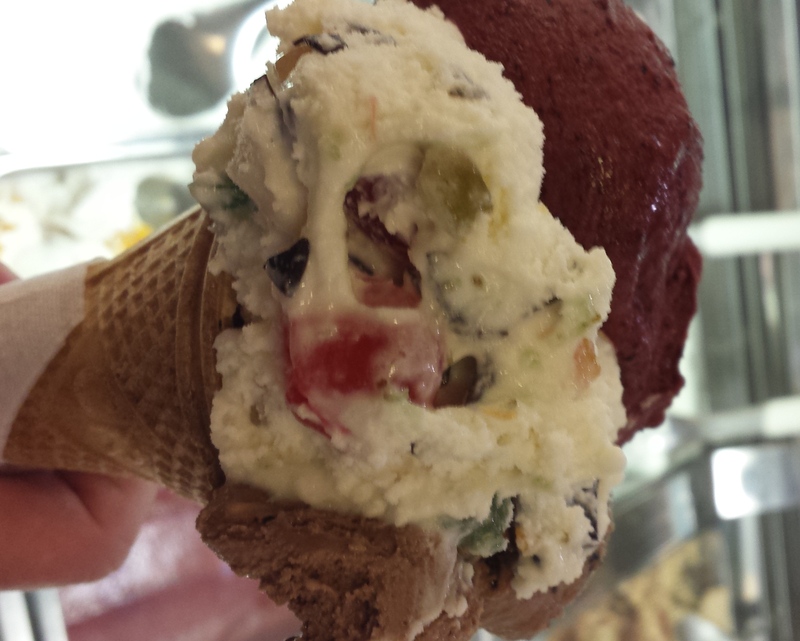 Cassata gelato is filled with cherries, candied fruit and thin long pieces of rich dark chocolate. Just eating this reminds me that the holidays are around the corner. We will definitely plan to make Cassata gelato in our Pinocchio’s shops both in Sanibel and in our franchise store in Greenwood, Indiana partly because I want our loyal Customers to sample this wonderful flavor and admittedly, partly because I do not want to wait another year for my next taste of Cassata Gelato. 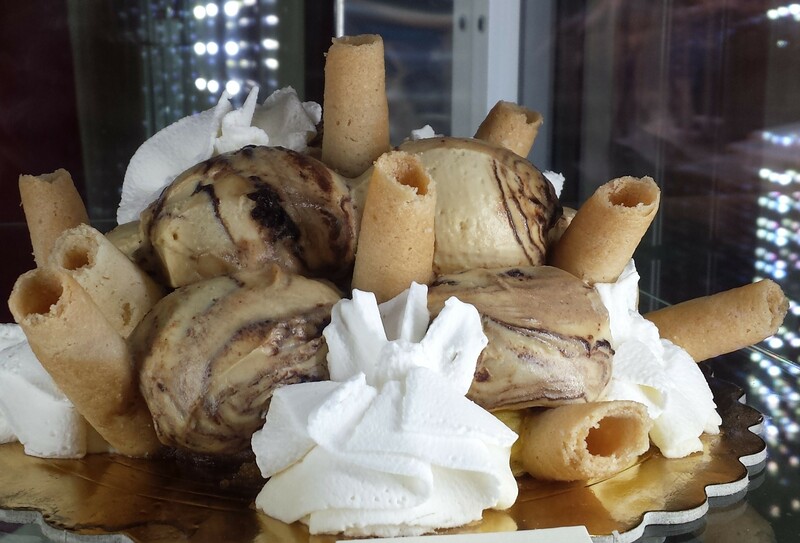 If you get the opportunity to try Cassata gelato, please do so. You will not be disappointed. I am always looking for a beautiful light starch to accompany a great piece of meat or fish. Risotto is just that starch. Although it appears easy to prepare, risotto takes time, patience and an eventual mastery in how much broth to use in making this creamy moist side dish. Trust me, it’s worth the time and effort to make this northern Italian staple. Parmesan cheese, mushroom, truffle and lemon risotto are a few varieties of risotto commonly found in markets. 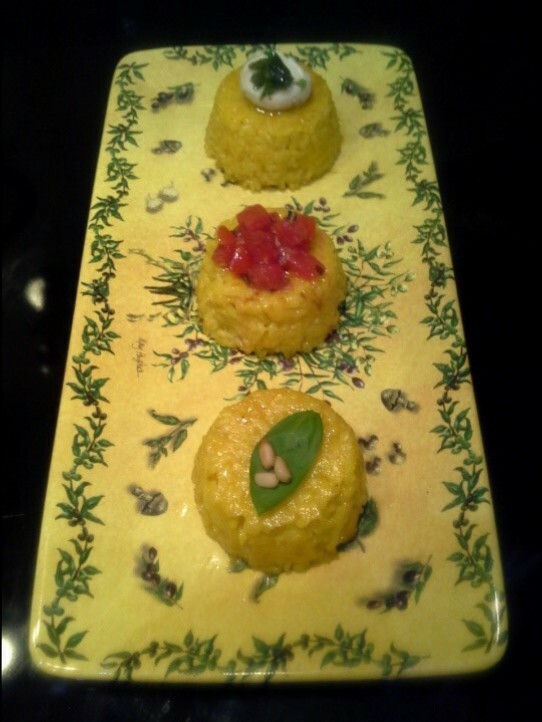 Depending on the risotto flavor, each variety is cooked in a vegetable or chicken broth. 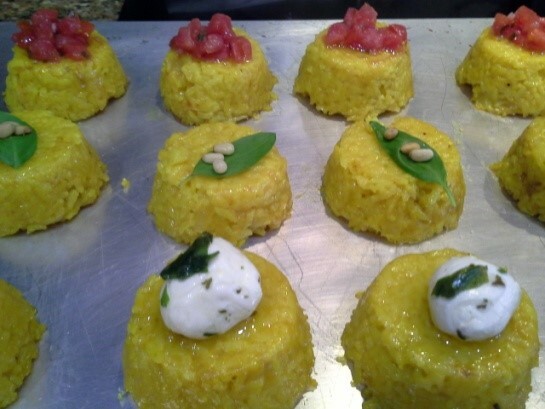 The recipe for these risotto cakes can be prepared ahead of time and warmed when ready to serve which makes them a great catering option for holidays and parties. The recipe below makes 12 cakes. A box of Risotto – I prefer Vita Verde Tuscan Country Milanese Risotto – 10.5 oz. Dice and sauté the onion in olive oil. Add salt, pepper and a little paprika to brown the onion. Set aside. Cut lemons in half. Juice the lemons. Add lemon juice to the water so that package directions for the water liquid remain the same. (Another words, I substitute some of the water with the fresh lemon juice). Prepare Risotto according to package directions. Add onion to the bouillon and water mixture. Cover and cook on medium heat 15 – 18 minutes. 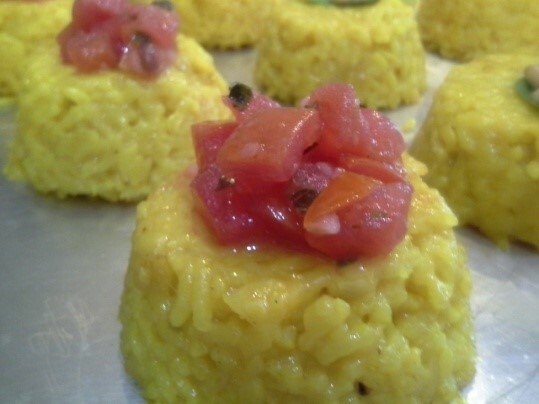 Make sure the risotto does not lose moisture during the cooking process. If it does, then slightly lower the heat and add a little more water. Let risotto rest 3 – 5 minutes. Spray a muffin tin with nonstick spray. Fill the tins with risotto and bake in 350 degree oven for 20 minutes. Let cool. Turn the risotto cakes upside down. Do you recall the first time that you ate spaghetti as a child? If you were like me, then the answer would probably be NO. I was so young and sitting in a high chair that I cannot recall that memorable moment but I can tell you that I begged my mother, my grandmother and my aunt to serve it to me plain, with a little butter and in (post high chair) time with some pecorino romano cheese. I did not want spaghetti sauce on my pasta. As I grew up into a young lady of 6 or 7 years, I would be adventurous and ask for sauce “on the side”. I still do at times but there are moments today that can only be captured by a good bowl of Bolognese sauce. Regardless of the sauce and pasta dressings, I waited to travel to Italy with my husband before I fell in love with pici pasta, traditional pasta from the Tuscany region of Siena. OK. 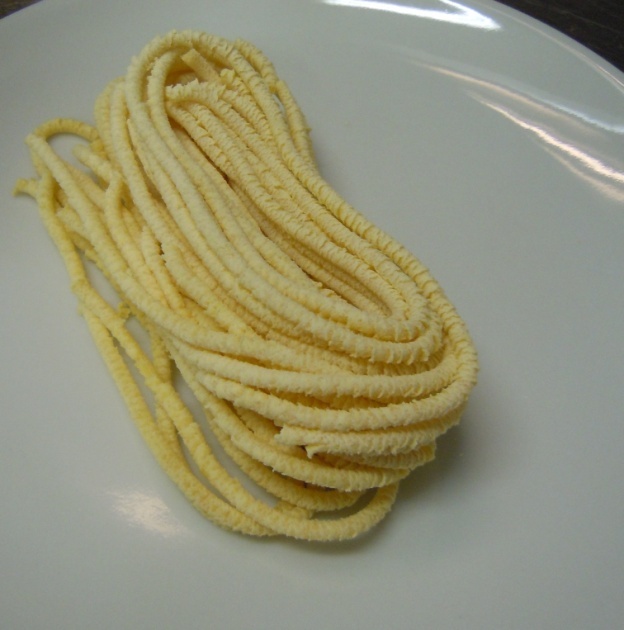 I love all pasta, especially fresh pasta like thin angel hair, spaghetti, linguine and bucatini but there is something so delicious about hand rolled pici pasta that I wonder why it is not served more frequently in restaurants in the states. Pici pasta is similar to Bucatini but the strands are thick long solid pasta shapes made from dough that is primarily water, flour and on occasion, egg. Each pici strand is individually hand rolled and no two strands are the same. 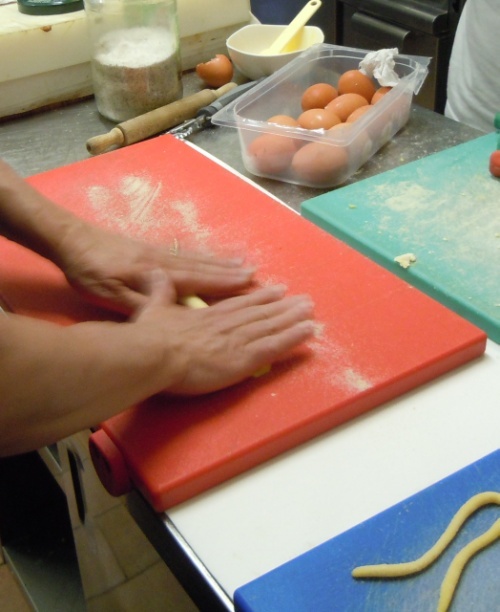 Here is a recipe for preparing pici pasta that our friends at La Ferreira in Loro Ciuffena shared with us. Enjoy! Slowly mix some of the water and flour until you can make a well in the center to add the egg. Continue to mix the flour, water and egg mixture. Add a dash of sea salt. At this point you may not need all of the remaining water. 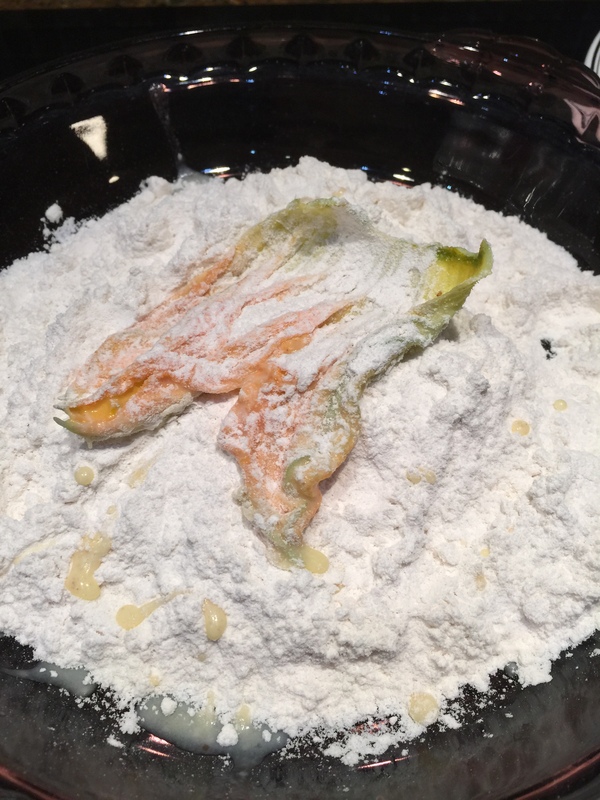 Use only enough water to incorporate the flour into the dough mixture. Generously flour your surface to prevent the dough from sticking. 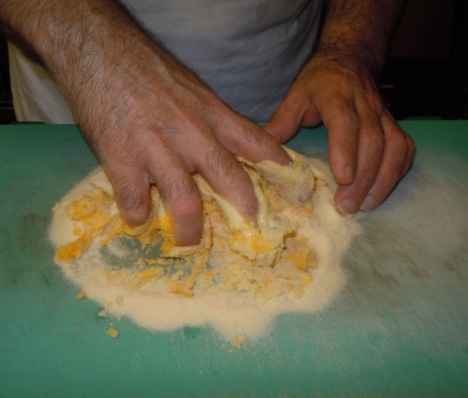 Roll the dough until it is ¼ inch thick. Take each strand and roll it back and forth with the front of your fingers to create long pici. 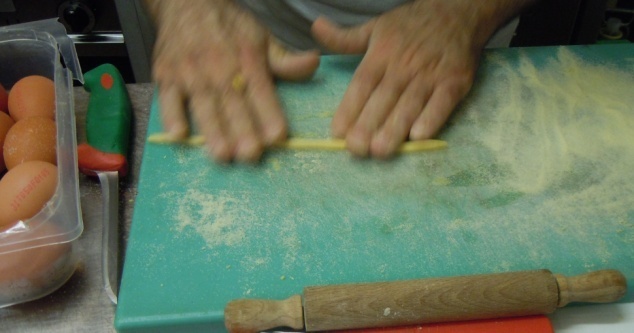 Add a little flour on the rolled pici to prevent sticking. Boil water with a pinch of salt and a cap of olive oil. 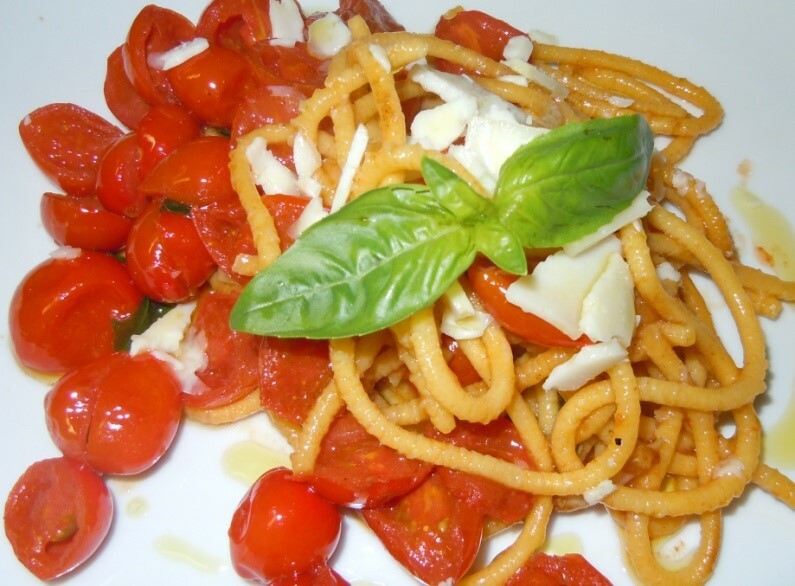 Cook Pici for 8 – 10 minutes until cooked ‘al dente’. Do NOT overcook pici pasta. Rinse well and set aside. Heat a frying pan with1/4 cup extra virgin olive oil. 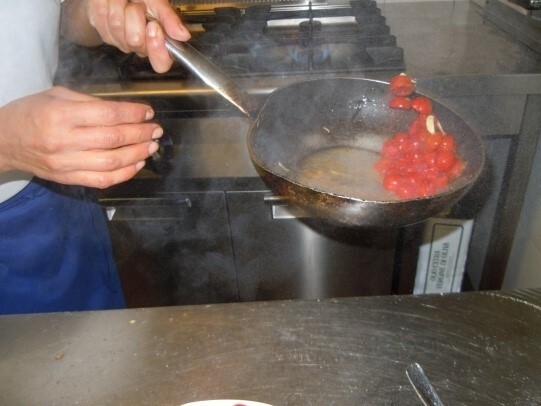 Season the oil in the frying pan with salt, pepper, crushed garlic and fresh basil. 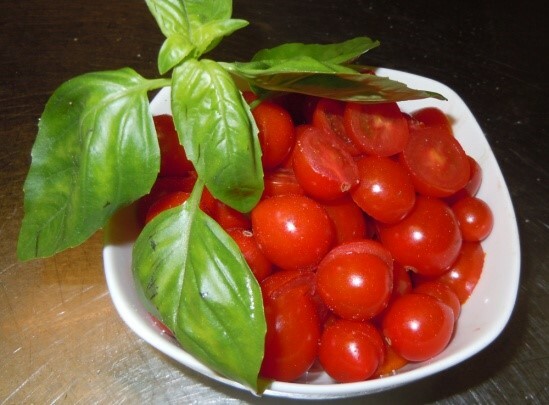 Prepare 1 cup Grape or Marzano tomatoes by cutting them in half, length-wise. 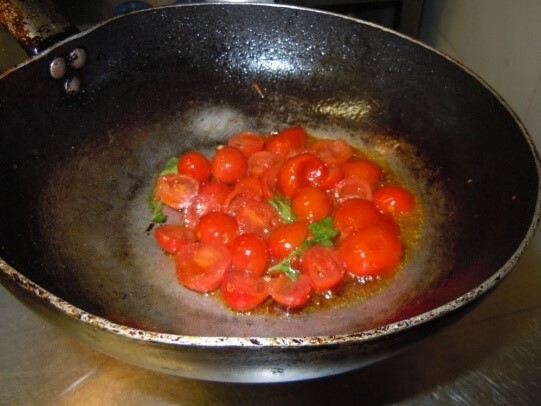 Add tomatoes to the frying pan. Reduce the heat to med-low setting. Add cooked pici pasta. 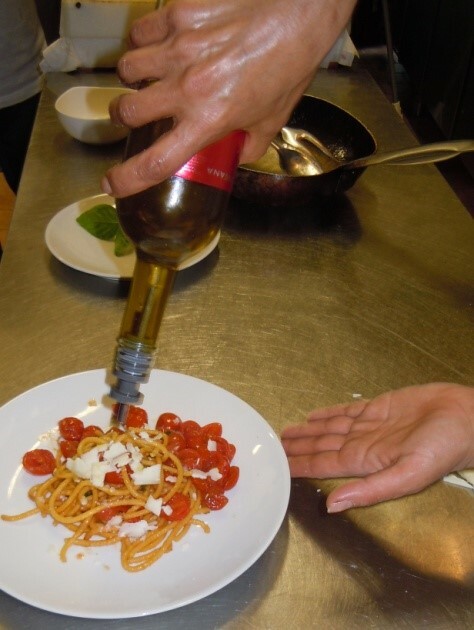 Add more olive oil – just enough to prevent the pasta from sticking to the pan. Pan fry pici no more than 4 – 5 minutes. Plate the pici pasta. Top with fresh basil and drizzle with a little more olive oil. Shave Pecorino Romano Cheese on top and enjoy. Guest Blogger: Veruska Koerner, President VK Media. Veruska is a native of Suriname and frequents the Sanibel Farmers Market with her husband,photographer Chris. Photos for this blog are courtesy of Christopher Koerner Photography. 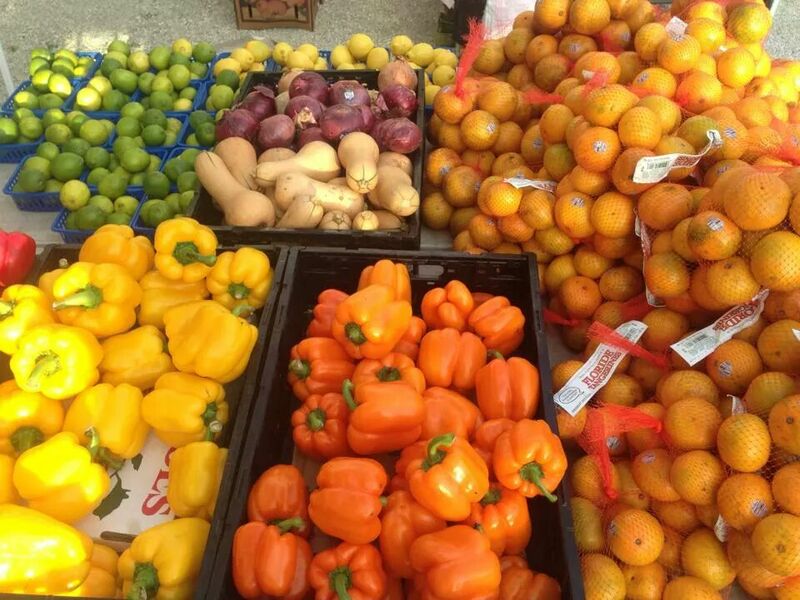 It is Sunday, October 5th and the first cool crisp Sunday morning which tells even those of us living in Southwest Florida that it is the beginning of the fall season and even better, it is opening day at the Farmers Market on Sanibel. The Sanibel Island Farmers Market was established in 2008. It is a favorite outdoor activity for islanders and visitors from October through April. Along with local produce vendors, you will find breads, honey, seafood, meats, flowers, cheeses and many other locally grown organic products that create a well-rounded enjoyable Sunday outing for everyone including well behaved dogs. This year, a few new vendors were added, which was a nice welcome to the familiar favorites. One produce vendor in particular caught my eye. They imported a variety of exotic fruits to the US, some of which I enjoyed in my native country of Suriname. I have never seen these fresh fruits in any markets or stores in or around Fort Myers and Sanibel/Captiva so you can imagine my excitement to taste a little nostalgia. There were Rambutan, Longan, Knippa also known as Spanish Lime in the USA and Carambola or Star fruit just to name a few. If you are not familiar with any of these, see if your local gourmet market carries them or if you are in Sanibel on a Sunday morning, then stop byand give them a try. Another must try was the Dutch vendor called Dutchkinz. He sold all sorts of typical Dutch treats such as oliebollen and poffertjes which are sweet fluffy spongy pancakes made with buckwheat flour. If you have a sweet tooth and never had any of these before, you are in for a treat. 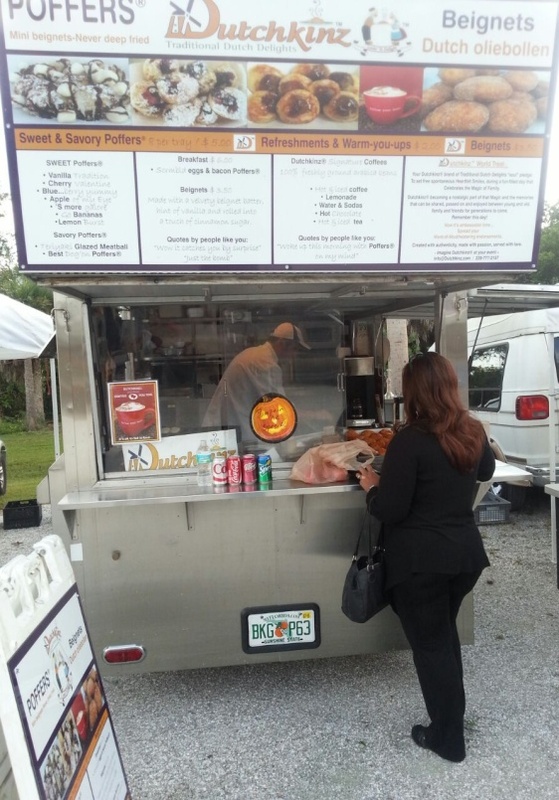 There is something for everyone at the Sanibel Farmers Market. 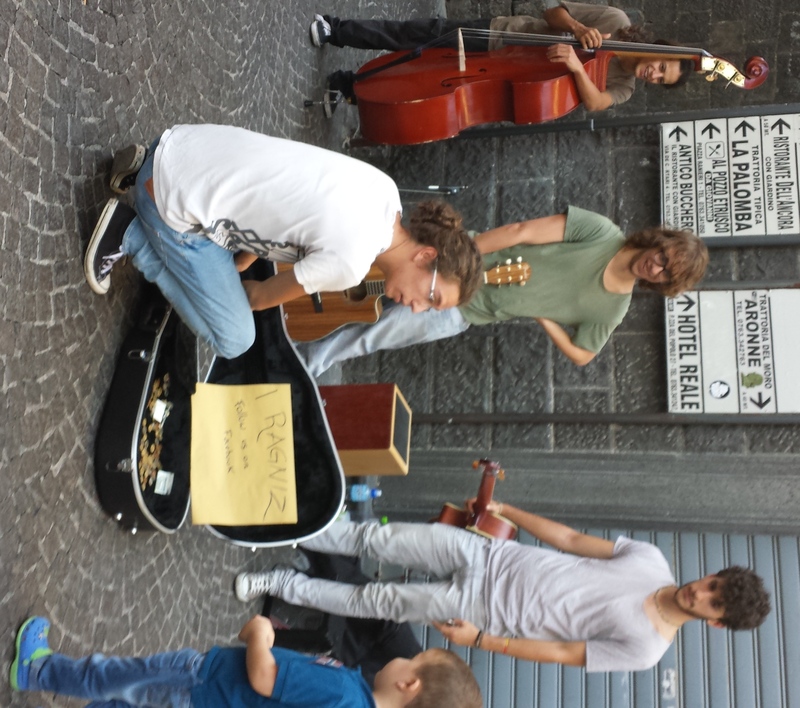 It has become a meeting place for the crowd of people who frequent this venue each week. The residents are there when the market opens. Vacationers meander throughout the morning and complete yet one more activity on their vacation travel bucket list. The vendors are friendly and the fresh produce will make your next meal a memorable one. Check it out if you are ever in the area. 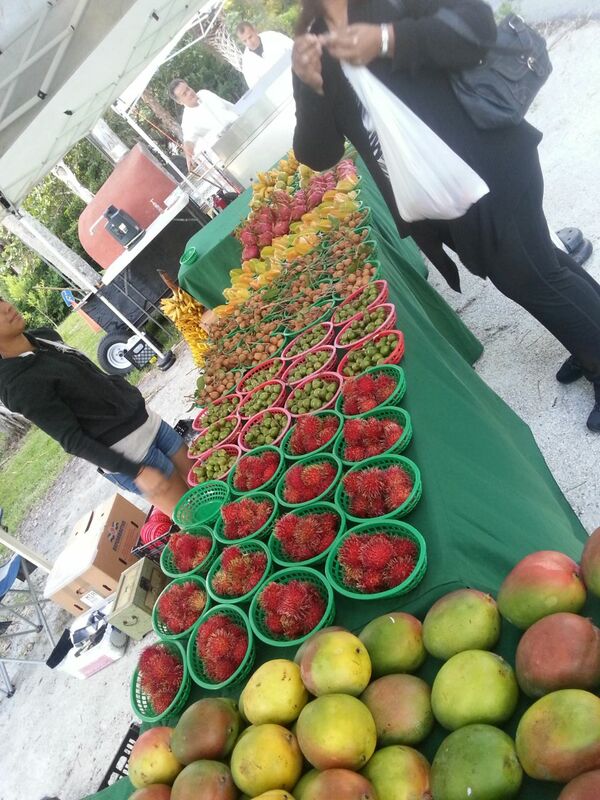 The Sanibel Farmers Market is open every Sunday through April from 8:00 am till 1:00 pm.